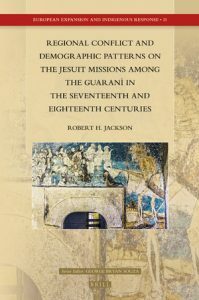 Robert Jackson, a specialist in Latin American history, has published a new volume on the Jesuit missions among the Guaraní in the 17th and 18th centuries. Regional Conflict and Demographic Patterns on the Jesuit Missions among the Guaraní in the Seventeenth and Eighteenth Centuries examines the important role these missions played in the “disputed Rio de la Plata borderlands” as the Spanish and Portuguese empires fought for control of the region. Jackson pays particular attention, according to Brill publishers, to the “demographic consequences for the populations of the missions, such as the spread of contagion,” as the conflict escalated. More information about this title, available through Brill’s European Expansion and Indigenous Response series,” is available at: https://brill.com/view/title/37946.